How to disable Charms Bar in Windows 8 & 8.1? In Windows 8 or Windows 8.1, the charms bar will appear when we move the cursor to the upper or lower right corners of the screen. But some computer users think this feature is annoying. The charms bar shows up many times when users accidentally move the mouse to the top or bottom right side corner. 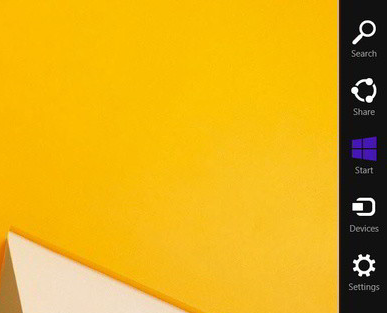 This article will show you how to disable the charms bar in your operating system. 1. Right-click on the Taskbar, and click on Properties. 2. 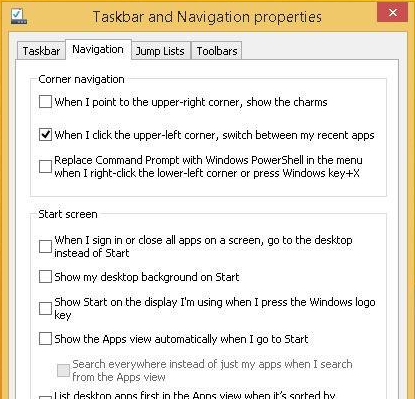 In Taskbar and Navigation properties, click on the Navigation tab, and uncheck the When I point to the upper-right corner, show the charms box, and click OK.
1. 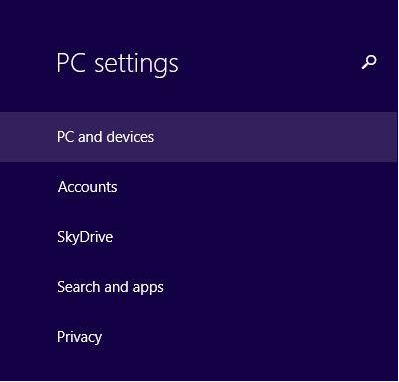 In Window 8.1 or Windows RT 8.1, hit Win + C keys to open PC settings, and click on PC and devices on the left side. 2. Click on Corners and edges on the left side, and drag the When I point to the upper-right corner, show the charms slider to the left to turn it off. 3. When finished, close the PC settings.